Grand Lexis Port Dickson (formerly known as The Legend International Water Homes) Port Dickson is a resort-style escapade that offers unparalleled levels of luxury and comfort in which every unit has its own private pool and a well-landscaped garden, proudly offering both exclusivity and privacy amidst the mystic charms of its natural surroundings. Grand Lexis Port Dickson (formerly known as The Legend International Water Homes) is accessible via the north-south Expressway and the Port Dickson-Seremban Highway, and the average travelling time from the city of Kuala Lumpur to Port Dickson takes approximately 75 minutes. 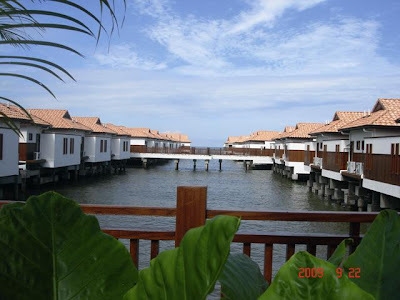 Located near Lukut Town, Grand Lexis Port Dickson (formerly known as The Legend International Water Homes) is just 2 kilometres away from Port Dickson Town and is well connected to all the places of interest such as Lukut Fort and Museum, Teluk Kemang Beach and Sungai Linggi Firefly Sanctuary. This luxurious 5 Star resort in Port Dickson features an exceptional collection of luxuriously furnished Balinese-inspired villas linked by spacious boardwalks that command a majestic view of the open sea. For your luxurious accommodation in Port Dickson, Grand Lexis Port Dickson (formerly known as The Legend International Water Homes) offers 249 spacious villas that are equipped with modern amenities such as air-conditioning, flat screen TV, wi-fi in-room connection, in-room safe and telephone. Each villa has a private pool and patio where one wants to take advantage of the pleasant views of the open sea. Comprising of Water Villas, Garden Villas and Sky Pool Villas, wake up and be greeted by the spectacular sea view everyday! Featuring an exceptional collection of luxuriously furnished Balinese-inspired villas that are linked by spacious boardwalks that commands a scenic view of the open waters, all units come equipped with its own private pool - an unsurpassed luxury and convenience. The interior of all guestrooms are fitted with Bali's natural tumble stone, marble and tropical hardwood flooring as well as granite vanity top, decorative fabric headboard, quality furniture and sanitary fittings. Soak in the luxury of your own private pool, enjoy the tranquil indoor garden and experience the spatial open air shower. Our sophisticated zen-inspired decor provides the perfect environment to renew your senses. 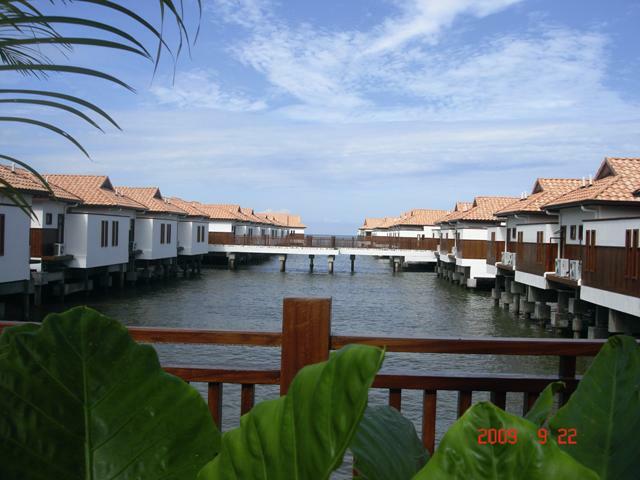 For delicious and sumptuous dining in Port Dickson, this Port Dickson hotel offers an exceptional variety of choices. The Duyung Restaurant serves a wide variety of local & international favourites, and offers a choice of alfresco seating for those wishing to take in the sea breeze as well as air-conditioned comfort. The restaurant also features an extensive breakfast buffet as well as a'la carte dining throughout the day from 6.30am to 12.00 midnight. An extensive room service menu is also available for your comfort and convenience. For those chilling out at the swimming pool, indulge in a drink or two at our Pool Café while having a good suntan at our sun-kissed pool, or one may also partake from a selection of light foods at the covered area after a few invigorating laps. Deck chairs and umbrellas are also available for sunbathing and a Jacuzzi pool is located amidst the lush landscape. For a great night out, head over to Lanun Bar to enjoy our resident live band in action, where a variety of cocktails, snack foods, fresh juices and liquor are available. Groove and unwind on the dance floor, or you can simply sit back and take advantage of the daily ‘happy hours’ promotion from 5.00pm to 9.00pm where selected beverages will be offered on discount to offer you value for money. Light bites are also available should you wish to fill those hunger pangs. Mixing business with leisure, Grand Lexis Port Dickson (formerly known as The Legend International Water Homes) also provides facilities for conventions and meetings where the Ballroom and Function Rooms can cater up to 450 guests and is suitable for events, conventions, seminars, wedding functions, meetings and other social events in Port Dickson. While you take care of your meetings, leave all the small details to our team to ensure that your meetings in Port Dickson will be a success. Let our dedicated events specialists orchestrate your meetings and functions with seamless and impeccable service. With a host of function rooms including the impressive Bunga Raya Grand Ballroom that can accommodate up to 650 persons theatre style (6,920 sq. ft.), you are assured of a rousing and successful event. 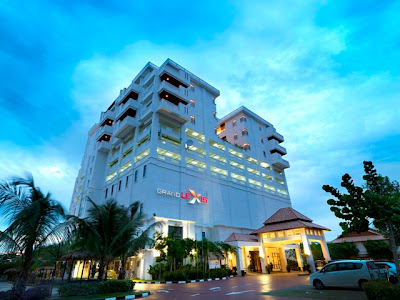 Grand Lexis Port Dickson (formerly known as The Legend International Water Homes) Port Dickson, with its ideal location, amidst the natural surroundings, offers a peaceful environment for guests to stay and explore the city of Port Dickson. Some of the area attractions include Tanjung Tuan Forest Reserve, Rachardo Lighthouse, Tanjung Tuan Beach and PD Ostrich Farm. Apart from the beautiful landscaped swimming pool, there is also a dedicated children’s pool and a gazebo. Outdoor games, bicycle rental, fishing and crabbing activities, an archery range and indoor board games may also be arranged. Guests who prefer the indoors will enjoy the games room. The Business Centre offers business-related services which includes facsimile, telex, internet and translation services. Coffee and snack requirements may also be arranged. 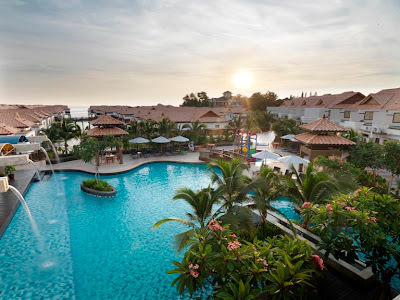 With all this and more, Grand Lexis Port Dickson (formerly known as The Legend International Water Homes) Port Dickson is definitely the perfect place to be for families, friends and business.